Nicknamed the "Island of Fire," Camiguin boasts attractions not found anywhere else in the Philippines, including hot springs, cold springs, soda water springs, 1 meter wide clams, black and white sand, surging waterfalls, and sunken ruins. There are few tourists, no touts, and cheap bungalows all along the coast. This is the Philippines of yesteryear. What isn't there to see in Camiguin? 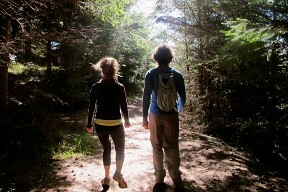 We had two full days, and we hardly scratched the surface of the natural "attractions." At first, we thought we'd go to Camiguin to relax, but once we realized all there was to see, we knew relaxing would have to wait another day. Even though the island is part of Mindanao, which most foreign embassies urge you to avoid, Camiguin is Visayan-speaking, Catholic (as opposed to Muslim), and far away from places that kidnap tourists for ransom (or worse). The top attractions are the huge 75-meter waterfall, the hot and cold springs, and White Island. Admission to everything is incredibly cheap, so you could splurge as much as possible and still spend well under $10/day on "entertainment." On our first day, we rented a motorbike, got a snorkel from the pier to White Island (75P for two-days) and set off for the Giant Clam Sanctuary, all the way on the other side of the island. Unfortunately, this privately owned organization that poses as a wildlife sanctuary, tried to charge us to use the snorkels we brought, which made us really annoyed. 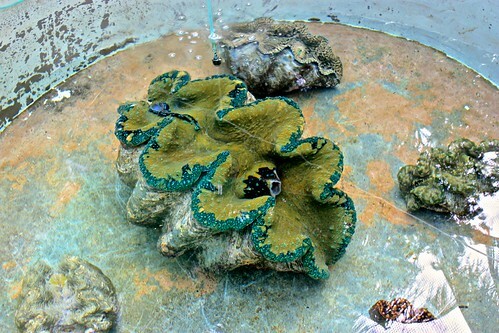 Because of this, we didn't actually snorkel with the giant clams, and instead just saw them in the "laboratory," which was really just a bunch of huge tanks full of sea water (25P). The beach with the clams did have decent snorkeling, but all the coral was dead. Where we did find living coral and TONS of fish was at the Sunken Cemetery. It looks exactly as it sounds. In 1871, a volcanic eruption wiped out a whole town in Camiguin and took with it a cemetery, a church, and hundreds of people. Where the cemetery sunk is now marked by the remainders of a huge cross, but underneath the cross is where the treasure lies. The tombs have long ago been covered up by coral, so the surrounding waters are full of beautiful fish and, evidently, giant clams. There's no charge to snorkel here, so if someone tries to make you pay, just say no. Walking in is a little iffy, but after you're knee-deep, you'll know it was worth it. The coral starts just a few meters from shore and continues up to the cross and all the way around. In low tide, you can see the old coastline of the island, where the reef has formed. 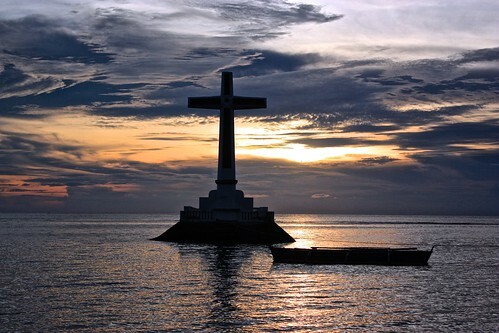 In high tide, you can swim over that line (directly behind the cross), and supposedly see giant clams. We tried to do this with a guide, but he called his friend who attempted to charge us a "sanctuary" fee. When we went back later, there was no fee, but the tide was too low to swim over the reef. Regardless, it's the best free snorkeling on the island. 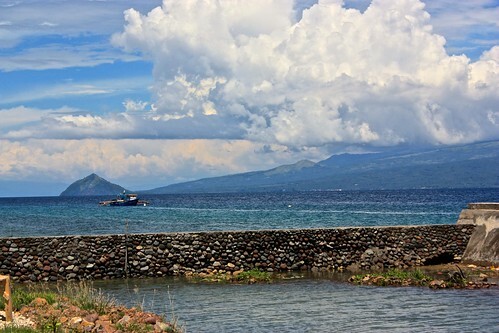 Camiguin is blessed with amazing weather and is much less humid than Bohol. Still, if you're hot during the day, there's no better place to cool off than the Cold Spring Resort (20P). Fed by natural cold springs coming down from the mountain, this icy water evidently also has therapeutic properties. If that's not enough, the local families will make you pose for enough pictures to make you feel truly special. There are Biblical images all the way up, and you're sure to warm up by the time you get to the top! The best thing to do at night is to head to the Hot Springs, amazingly priced at 30P. 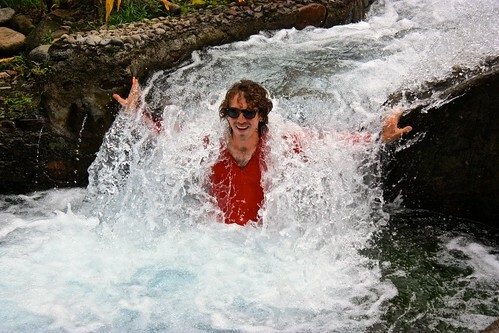 Again, don't be surprised by people snapping pictures of you in the pools. If you're gracious enough, they might even invite you to a picnic. One family we saw had an entire suckling pig! If you go in the middle of the night, make sure to ask the lifeguard where the hot ones are. We didn't find them until the end, when I was nearly hypothermic. 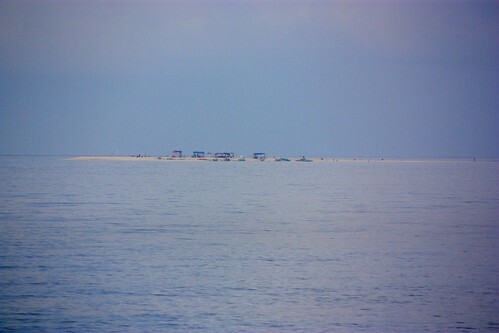 Two islands are accessible by a short boat ride from Camiguin. White Island is visible from Bug-Ong and looks like a stranded island fantasy, with its few palm trees protruding from the water. It's supposed to be an amazing sunset spot, though the snorkeling/diving is much better at Mantigue Island, on the other side of the mainland. Boats to each island cost around 500P, but can be split between 6 people. I think you get the point. Camiguin is really special, and you're sure to love it whether you do a ton, or nothing at all. Most of the budget resorts are in Bug-Ong, with great sunset views and black sand beaches galore. We stayed at Seascape in a big attached bungalow for 600P! The price was perfect and we had a good (though not great) view of the ocean. The bungalows with unobstructed views cost a bit more, but they were booked when we showed up without a reservation. Either way, we enjoyed a great sunset on the black sand beach. Eating at Camiguin is surprisingly expensive, so if you're on a budget, self-catering might be your best bet. The staff at Seascape was nice enough to let another group do most of their cooking and grilling for free. For dinner, our favorite place was Northern Lights restaurant, near the pier to White Beach. They had reasonably priced food and a good view of the sunset. Compared to Bohol, we had a harder time finding local options that worked for vegetarians, so our bread and peanut butter came in handy! You'll have to take a tricycle from the ferry port to your hotel, so be sure to negotiate the price. The slow ferry docks at the closer port (Balingoan), and you can get a ride for 100P. From Benoni, the farther port, it should cost around 200P. The best way to see Camiguin is to rent a motorbike. Don't pay more than 400P. We paid 300P/day for a two-day rental from Seascape. When it comes to leaving, most visitors opt to return to Bohol and go on from there. You again have a choice of the slow (400P) or fast (600P) ferry, but ask for the most recent schedule as the companies tend to cancel trips at the last minute. Once in Bohol, take a bus back to Tagbilaran (60P) and continue on from there. We made our way to the ferry terminal and booked a boat to Siquijor, which was a pricey 820P each. Interested in seeing the sunken cemetary and hot springs without paying for a plane ticket? 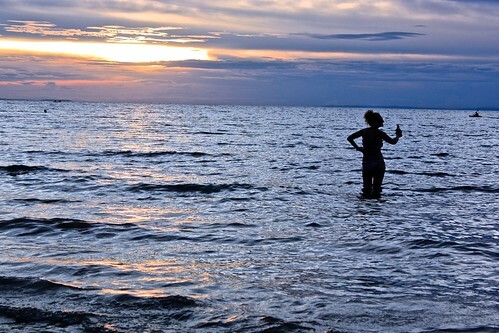 Check out our Camiguin photo tour. If you have any tips for backpacking in Camiguin, let us know in the comments!